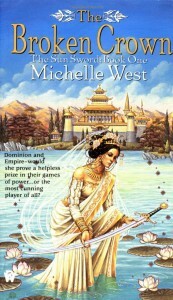 From Goodreads.com: The Dominion, once divided by savage clan wars, has kept an uneasy peace within its border since that long-ago time when the clan Leonne was gifted with the magic of the Sun Sword and was raised up to reign over the five noble clans. But now treachery strikes at the very heart of the Dominion as two never meant to rule–one a highly skilled General, the other a master of the magical arts–seek to seize the crown by slaughtering all of clan Leonne blood. Why I recommend it: This is the first book in a six-book-long fantasy series. I recognize that not everyone has that kind of time or love of fantasy, but for those who are able to invest the energy and attention into the series, they will find a very rich world with vivid characters and gripping political struggles. This particular book starts out a little slow, as it’s setting the stage for much of the series-wide conflict, but I had a hard time putting it down the first time I read it, and subsequent re-reads always reveal new information I’d missed. If fantasy, world-building, and political intrigue are your cuppa, this series is not to be missed.